Recap: This is my second progress report where I share with you how I’m making progress on my goal of creating a location independent business from scratch. Remember, we’re putting it all on the line and living on our savings and some passive income while we invest in ourselves, our kids, our family and try to create a business that will support our lifestyle while also spending a year in the south of France. Plus my husband is writing his first novel. You can read about it and watch the video I made on the subject by clicking here. I hope that by sharing with you my progress you will not only learn from my successes and failures but also get motivated to pursue your own dreams no matter how big or small. My progress this month towards my goals. 2 things happened this month that pushed me a wee bit closer to making my location independent business dream a reality. I clarified my brand and I’m going to be on T.V. Before I get into the details about the t.v. show let me first tell you about why and what i did to my brand. 1- Made my brand and my services more clear. I read somewhere that when a person comes to your site, in addition to having relevant helpful information, you have to make a good first impression and you only have a few seconds to do that. One of the gazillion ways you do that is through your header. (The image at the top of your website). The header often has to do double duty. It not only has to be visually appealing but it has to tell your readers what they are gonna get by visiting your site at a glance. A picture really is worth a thousand words. I thought my old banner (the one above), was ok visually speaking but I felt like there was a disconnect with what i am trying to do and what message i am giving with my banner. In other words, I didn’t feel like it gave the reader a clear vision of what the site and what I was all about or how I was going to help them. It was too vague so I niched it down and made some visual modifications. I went to the drawing board and came up with about 5 new header mock ups and finally settled on the one you see above. It took me about 8 hours to make it. I know it seems like a long time but it’s not as easy as it looks. What Changed and Why I made them. Font: The first thing I changed was the font on the words “Practical Adventure-ology”. I don’t know about you but when I think of adventure, I think Indian Jones so naturally I searched for the closest font I could find that mimicked the font used on the Indiana Jones movie posters. I found a font called “Adventure”. See for yourself. It looks pretty close don’t you think? Colour: The second thing I changed were the colours. I wanted to give the feeling of adventure but in a more practical way. Fiery red and yellow didn’t seem like a good fit. I went to the local french bookstore and library here in Marseille looking for inspiration. I found it in retro and vintage looking travel and adventure books. The end result, I went from a dark Blue, pink and brown to a more lively aqua blue, a cream-sickle orange and of course the Brown. I think it gives it a fresher look but not too racy. Updated Photo: I took a new photo of myself using my Cannon T3i Camera (in Europe they are called 600d and not T3i). 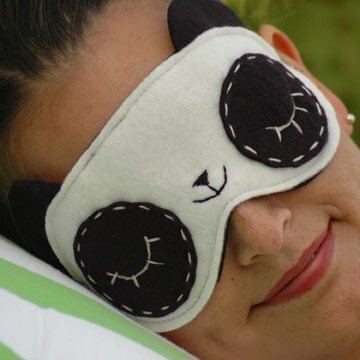 It was a piece of cake compared to what i used to have to do when I had my sleeping mask business. Try taking a picture of yourself blind folded and you’ll understand what i’m talking about. Anyways, you can take a picture of yourself too. All you need is a remote control for your camera or if your camera doesn’t have that capability, put the timer on. Travel Visuals: Because travel is such a big part of my site, I had to find some way to convey that message without making the banner look too cluttered. I ended up putting some polaroid looking photos on the banner and then I added the paper airplane followed by a white dashed line to indicate movement. Tagline: Ask any entrepreneur or solo-preneur but coming up with a good tagline is harder than it looks. My old tagline was vague and more like my motto [ “Find Adventure, Go Travel, Live Your Dreams”]. I changed it to “For Busy hard working people who want to take a break to travel more, do what you love, live your adventure and purpose” Then I added little bullet points telling you exactly what I talk about. Career breaks, long term travel, sabbaticals etc.Now my readers come to my site and they know exactly what they are going to get and how it’s going to benefit them. I did a few more changes but those were the big ones. What do you think? Did I achieve my goal? Is it more clear now what I do and do you like it better than the old one? Leave your comments below. Indirectly promote it that is..
My family and I will be on national T.V. Not just any T.V. show but a show called House Hunters International on the HGTV channel. I just recieved word that the show will air on June 20th at around 10:30 p.m. I think it’s pacific standard time. For now it is only shown in the U.S. 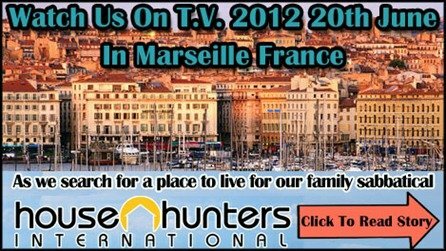 If you are not familiar with house hunters international, let me give you a quick background about it. 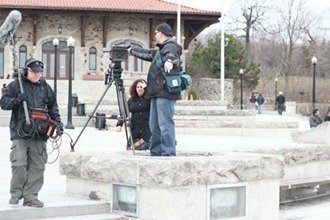 House Hunters International is a spinoff of the wildly popular HGTV show called House Hunters which takes viewers behind the scenes as individuals, couples and families learn what to look for and decide whether or not a home is meant for them. 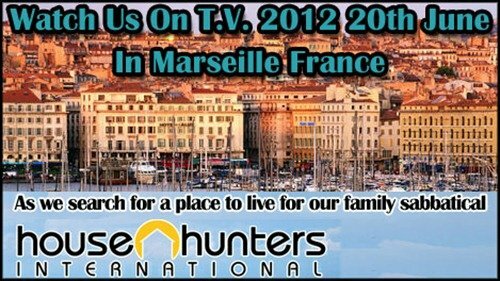 House hunters international ( the spin off) has been a huge hit for HGTV and has been on the air for over five years now. The show is based on the same premise as house hunters (U.S.A.) with a twist. That twist is probably partly the reason for the shows popularity. You see, it taps into the viewers dream of living in exotic and far away locations from the comfort of their couches. You get to vicariously globe trot around the world as you watch individuals, couples and families and their real estate agents check out all sorts of architectural styles and work through the idiosyncrasies of buying or renting real estate in other countries. 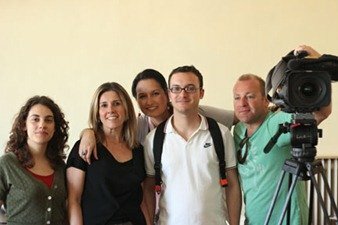 In the episode about us, a film crew followed us around Marseille as we looked at different homes that we could live in for our year long family sabbatical in France. You also get a bit of back story as you get to see me in Montreal with my family talking about our trip to France. The best part is you get me on camera eating POUTINE. A very Quebecois dish of French fries, gravy and cheese. It’s the BOMB. I won’t get into the details about the filming. Maybe later I’ll share more. Now, you are probably wondering how being on House Hunters international is relevant to my location independent business goals. The topic of finding a place to stay while on a career break or sabbatical abroad is one of the many hurdles one has to jump through when planning an extended trip abroad. Since the show gives you a peak into the trials and tribulations of finding a home abroad it ties in nicely with my “Career Break & Family Sabbatical Mentoring Business”. Like any business, I need exposure. The more exposure, the more eye balls on me and hopeful one of those eye balls will look to hire me to help them plan their career break or family sabbatical abroad. There is nothing better than free exposure. Plus it was so much fun making the show and i learned a bunch of video tricks.. If you are interested in the show, you can read a short bio about the episode here. That’s it for now. Hope you enjoy this sneak peak into the actual work that has to go into creating a location independent business while on a family sabbatical abroad.. It’s not all a bed of roses. It’s hard work people..